Should anti-gay Pastor be allowed in South Africa? 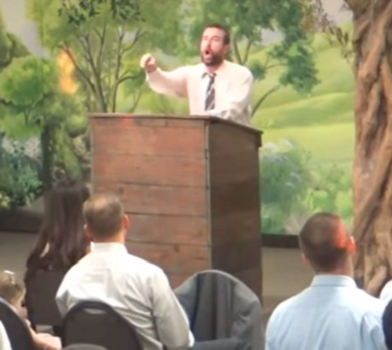 Controversial and outspoken anti-gay Pastor, Steven Anderson has been granted access to South Africa by the Department Of Home Affairs. Trending Tonight brought up the controversial topic of Pastor Steven Anderson, a hugely vocal anti-gay homophone, who has been granted permission to travel to South Africa. In a recent video on his YouTube channel Pastor Anderson says he is pleased the “sodomites” did not succeed in having him banned. He made reference to the LGBT community and the South African Government coming together to meet over a possible ban. However he has been granted access to tour his “soul winning” campaign. Wimpy and Spur have released statements saying that they do not support his tour and he is not welcome in their establishments as previously arranged. After consulting all parties concerned and taking into account South Africa’s constitution the Department of Home Affairs have granted him access, however they have said he has to “behave” himself otherwise he may be detained and prosecuted. We opened up the lines and this is what you had to say. An updated video from Pastor Steven Anderson on being allowed entry to South Africa.